“I got another one,” Hal said to me, but I was too busy reeling in my own bream to pay any attention to him. We already had full stringers of nice bluegill at our feet but we continued to catch one on almost every cast. Hal and I had dug some red wigglers behind the chicken house on my family’s farm then rode our bicycles to Black’s pond to fish for bass and bream. We were very happy since school would be out in just two more weeks and the long summer filled with fishing trips would start. 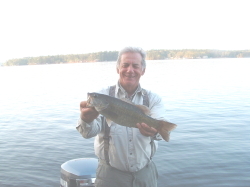 When we got to the McDuffie County pond owned by the family of a teacher at Dearing Elementary School we tried for bass for several hours without much luck. Then we went to our favorite place to catch bream in the upper end of the pond. There were two boards on the bank so we could stand side by side and cast without sinking into the soft bottom. Most days we would catch a few bluegill near the scattered stumps in this spot then move one when they quit biting. Our tackle was simple, both of us had Mitchell 300 reels on Conlon six-foot spinning rods. The ten pound test line was good for all kinds of fishing. On the end of the line was a #6 hook, a small split shot and a cork. We stood on those boards and caught fish until it started to get dark. We had to hurry back to our bikes and head home fast to beat the night. As we rode home we commented that the full moon would keep it from getting completely dark and that could be our excuse for being so late. All week we talked about going back and catching a pile of bream again. The next Saturday we went back to the pond and caught one or two small bluegill from the same area that had been so good the weekend before. We had no idea what happened to change the fishing, and did not realize that full moon had anything to do with our good luck. We had hit a bedding area without knowing it. Bluegill are common in all Georgia waters and are always cooperative. You can catch them on just about any bait and they are great fish to start kids with since they can enjoy the thrill of catching something. But the full moon in May is a special time for Georgia bream fishermen. The full moon is the time bream bed. Although bluegill will start bedding as early as late March in middle Georgia and some will bed every month from then until fall, May is the height of the bedding for them. Add in the spawn of shellcracker that bed just on the full moon in May and you have a bonanza of great fishing this month. May 2 is a full moon so fishing should be good the first week of the month. There is almost a blue moon in May, with another full moon on June 1, so the end of the month will also be good. Starting about a week before the full moon bluegill move into the shallow bedding areas and fan out a depression on a hard bottom. The female will lay her eggs in the depression and the male fertilizes them. Both fish will stay and guard the nest until the eggs hatch several days later. They will hit anything that looks like a threat to their eggs, as well as anything that looks like food, for about a week. Many bream fishermen claim they can smell out bluegill beds, and you will often notice a distinctive odor near them. It is described as smelling like watermelon but not exactly. It is a musty smell that you will recognize once you experience it, and will remember it. If you hit that smell, look for beds nearby. To find beds, go to the upper ends of coves and look for them in shallow water, from two to six feet deep. If the water is not muddy you will see the beds as light spots against a dark background. This is the depression fanned out by the male to make the bed. Bream like to bed in large groups so you are not looking for one or two scattered beds. A good sandy spot protected from the wind in the back of a cove will often look like a waffle on the bottom, with beds almost touching each other. In muddy water the beds will be more shallow, in real clear water a little deeper. If you find beds one year they are likely to be in the same place the next year. Any hard bottom will do but sand seems to be preferred, and some scattered stumps make it even better. You can find beds from the bank but a boat makes it easier. Cruise the shallows very slowly until you spot them. You will probably spook the fish but if you back off and wait about 15 minutes the fish will be back. 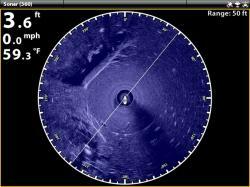 It is a good idea to anchor your boat a long cast from the beds so you don’t get too close and spook them while fishing. From the bank ease around until you spot the beds. Wear dark or camouflage clothing and don’t make fast movements. Stay low, too. Try to keep any bushes on the bank between you and the beds. While fishing stay low and don’t approach too close. Long casts are best to keep from scaring fish away. 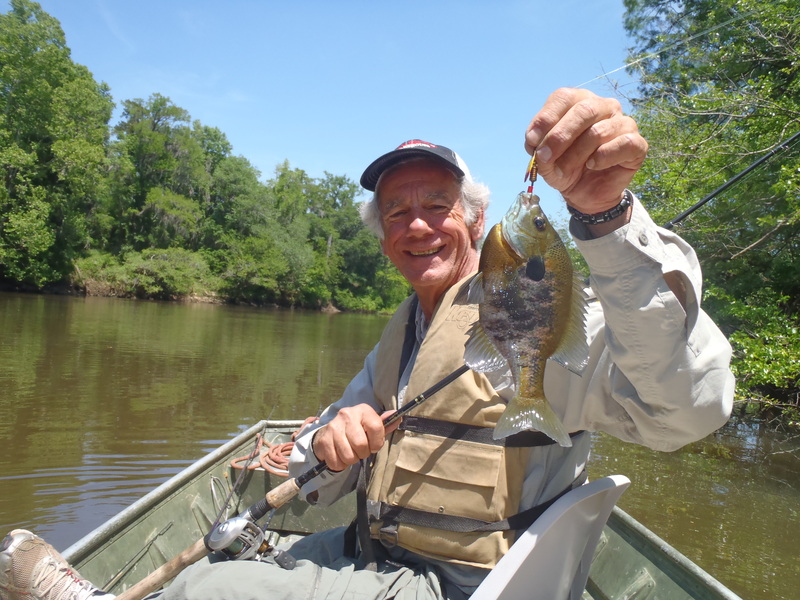 You can find bluegill beds on any of Georgia’s waters from rivers to big reservoirs, but smaller public ponds are your best bet. Scattered all across middle Georgia are small public lakes and ponds you can fish. The following list should contain some within a short drive of you. Indian Springs State Park Lake is a 105 acre lake in Butts County four miles southeast of Jackson on Georgia Highway 42. There is a good paved boat ramp and you can rent a boat there, too. Camping and cabins are available for longer stays. A $2.00 parking fee gives you access to bank fishing or boat launching. Boat motors are limited to 10 horsepower or smaller and you can fish from sunrise to sunset year round. The lake has many protected coves where the bream bed and the upper end has good shallow spawning flats. John Tanner State Park has two lakes, one 15 acres and one 12 acres in size. They are located in Carroll County six miles west of Carrollton off Georgia Highway 16. You can camp there if you want to stay but a $2.00 daily parking fee gives you access to both lakes for fishing from the bank. You can rent a boat but you can launch your private boat only on the smaller lake. Boats are limited to electric power only. You can fish from 7:00 AM to 10:00 PM daily all year long. The lakes are small enough to cover easily to find the bedding areas. If you have a boat look for beds in areas not easily accessible to the bank fishermen. Blalock Reservoir is a 260 acre lake in Clayton County south of Jonesboro near US Highway 19/41. A boat ramp allows you to launch and there is bank fishing allowed for a small access fee. Boats area limited to 16 feet or shorter with electric motors only. You can fish from dawn to dusk Wednesday through Sunday year round. Many shallow areas are good for bedding bream and a boat will cover this lake better than fishing from the bank. Contact them at 2755 Freeman Road Hampton, GA 30228, phone (770) 603-5605. J. W. Smith Reservoir is a 250 acre lake in Clayton County 10 miles south of Jonesboro on Panhandle Road. There is a boat ramp on the lake and you need a season pass or pay a daily fee. Wednesday through Sunday, April 1 through September 30 from sunup to sundown. 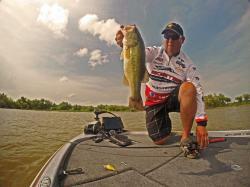 There are many areas of this lake you need a boat to fish effectively. Contact the Clayton County Water Authority at 2755 Freeman Road Hampton, GA 30228, phone (770) 603-5605. Shamrock Reservoir is a 68 acre lake in Clayton County south of Jonesboro near US. Highway 19/41. There is a boat ramp and this lake is designated a “Kids Lake” so no adults may fish the lake unless they have a kid 12 years old or younger with them. There is a user fee. Boats are limited to 16 feet or less and electric motors only. Open from dawn to dusk Wednesday through Sunday year round. Since access is limit to those with kids, this lake is a great choice to take your kids fishing. Contact the Clayton County Water Authority listed above. Lake Horton is a 780 acre lake in Fayette County south of Fayetteville near Georgia Highway 92. There are two boat ramps and the daily fee is $10 for non-Fayette County residents. Boats are limited to electric only and the lake is open 6;30 AM to 6:30 PM daily. This lake is known for big bass but its sunfish population is good and spawning area are scattered all over the lake. Horton is owned and operated by Fayette County P.O. Box 190 Fayetteville, GA 30214, phone (770) 461-1146. Lake Kedron has 235 acres with a boat ramp. It is in Fayette County off Georgia Highway 54 near Peachtree Parkway. There are no special fees. Fayette County, see contact above. \Franklin D. Roosevelt State Park has two lakes, Franklin at 23 acres and Delano at 18 acres. They are located in Harris County east of Pine Mountain on Georgia Highways No private boats but boat rental is available. . Camping and cabins are available. You can fish Delano year round and Franklin with a permit from September through May. There is a $2.00 parking fee. Contact them at 2970 Hwy 190 Pine Mountain, GA 31822, phone(706) 663-4858. Barnsville Reservoir in Lamar County has 160 acres and is located off Highway 36 near Barnsville. There is a boat ramp and yearly permits are required for fishing and for boat use. Boats are limited to electric motors only and the lake is open year round. Contact the City of Barnesville at 109 Forsyth Street, Barnesville, GA 30204, phone (770) 358-3431. McDuffie Public Fishing Area has 13 ponds from 1 to 28 acres and is located in McDuffie County four miles southwest of Dearing off U. S. Highway 278. There are boat ramps on some of the lakes and camping is available. Boats are limited to electric only and a state fishing license as well s a WMA stamp is required. Lakes are open from sunrise to sunset daily year round. I grew up less than two miles from these lakes. They were private until I was a teenager. My mother loved these lakes and I have the mount of a 2 pound, 6 ounce bluegill she caught there. The lakes are managed for fishing and all lakes are excellent for panfish. Contact them at 4695 Fish Hatchery Road Dearing, GA 30808, phone(706) 595-1684. Lake Meriwether in Meriwether County has 144 acres and is located one mile southwest of Woodbury on Georgia Highway 85 Alt. Camping is available and there is a daily fee for fishing. Boats are allowed but restricted to electric motors. Owned the County Commissioners Office, P. O. Box 428 Greenville, GA 30222, phone (706) 672-1314. High Falls State Park has a 650 acre lake and is in Monroe County 10 miles east of Forsyth near I-75. There are two boat tramps and boat rental as well as camping available. There is some bank fishing but most of the lake shore is private. Motors are limited to 10 horsepower, a $2.00 parking fee is required and the lake is open from sunrise to sunset daily. This lake is very fertile and has good populations of bluegill. The back ends of most creeks are sandy and offer good bedding areas. Lake Olmstead in Richmond County is an 87 acre lake in northeast Augusta near Georgia Highway 28. There is a public boat ramp but no camping. There are no fees to fish here and there is good bank access. Motors are limited to 9.9 horsepower except on Tuesdays, Thursdays and Saturdays when there is no limit. The lake is open 24 hours a day all year. This lake gets a lot of pleasure boat traffic on days big motors are allowed, so plan your fishing trips on the days motor restrictions apply. Hamburg State Park Lake is 225 acres located in Washington County north of Sandersville off Georgia Highway 102. There is a boat ramp and you can rent boats as well as camp. A $2.00 parking fee is charged. Motors are limited to 10 horsepower and the lake is open all year from sunrise to sunset. There is excellent bluegill fishing in the pockets and coves. Big Lazer Creek Public Fishing Area has a 200 acre lake and is located in Talbot County northeast of Talbotton near Pobiddy Road. A boat ramp is available as is primitive camping and you are required to have a Wildlife Management Area stamp a well as a fishing license. There is no motor limit size but all must be operated at idle speed only. The lake is open from sunrise to sunset daily all year. It is managed for good fishing and the lake has excellent populations of bluegill and shellcracker. Houston Lake is 180 acres in Houston County east of Perry on Georgia Highway 127. There is a boat ramp and good bank fishing access. No fees are charged at this lake. Motors of any size can be used but at idle speed only. The lake is open during daylight hours year round and offers good bluegill fishing from boats or the bank. This is just a partial list of lakes open to the public in middle Georgia. For a complete list, go to http://georgiawildlife.dnr.state.ga.us/content/displaysmalllakes.asp to find lakes by name or by county. Find one near you, hit it on the full moon this month and enjoy some fast panfish action. 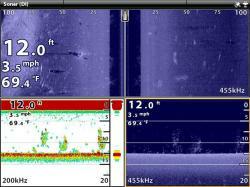 This entry was posted in Bream Fishing, Fishing Information, Fishing Tackle, How To Fish, Where To Fish on October 17, 2013 by ronniegarrison. Fishing the Flint River is always fun and bream always bite there. The river is most famous for its shoal bass population, a subspecies of black bass found mostly there and a few other places, but sometimes they are tough to catch. But bream always bite. The Georgia Outdoor Writers Association spring conference was held at Albany, Georgia this year and we got some chances to fish the Flint. I went with fellow member Vic. O. Miller. a local writer who knows the river well. I was warned that he had a habit of turning over boats on the river but we managed to come home dry. I was a little worried. The first thing I did after getting in the boat was put on a life jacket but Vic warned me it didn’t float! 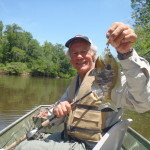 I tried several baits for bass but had no bites while Vic got a lot of hits from bream on his fly rod , so I went with the flow and tied on a Mepps Spinner and started catching bluegill and long ear sunfish. As luck would have it, I also caught two small largemouth. It was a fun trip and I came back alive and dry! This entry was posted in Bream Fishing, Fishing Ramblings - My Fishing Blog, River Fishing on May 2, 2013 by ronniegarrison.